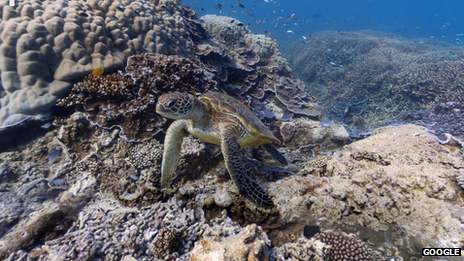 Panoramic images of several coral reefs have been added to Google’s Street View service in its maps, allowing users to navigate their way around the sites. The material was gathered by the Catlin Seaview Survey – a project studying the health of the reefs, including the impact of global warming. The programme’s director said the effort would help scientists analyse ecosystems and raise general awareness. It is also a publicity coup for Google at a time of growing competition. Google has previously offered computer-generated views of the sea floor terrain, but this is the first time it has incorporated underwater photographs into its mapping product. “We want to be a comprehensive source for imagery that lets anyone explore anywhere,” Jenifer Foulkes, Google’s ocean programme manager, told the BBC. Locations added to the service include Australia’s Great Barrier Reef near Heron Island, Lady Elliot Island and Wilson Island, as well as Hawaii’s Hanauma Bay and Molokini Crater and the Philippines Apo Island.